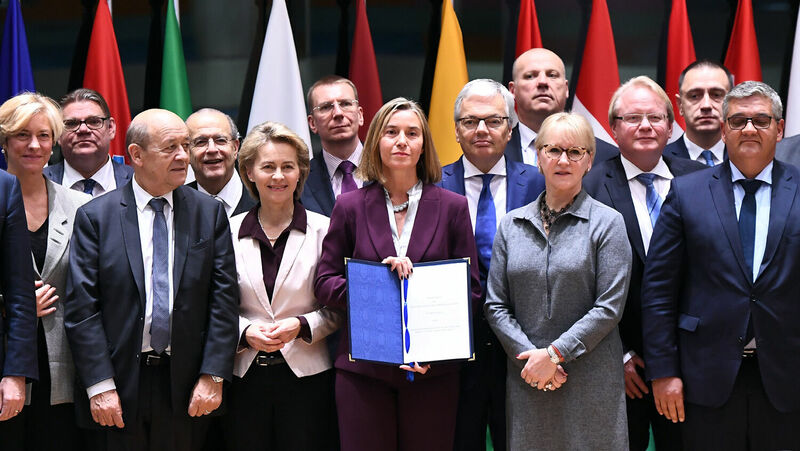 European foreign and defense ministers from 23 EU member states signed a notification on Permanent Structure Cooperation at the European Council in Brussels on November 13. A small group of European Union nations is beginning to create a new military superpower. Twenty-three European Union member nations took a major step toward the formation of a European army on November 13. Meeting in Brussels, the nations agreed to coordinate their defense spending and planning in order to boost the fighting effectiveness of the EU as a whole, rather than designing their militaries to defend only their individual borders. One of Mogherini’s advisers, Rome’s Institute of International Affairs director Nathalie Tocci, called it “a potential game changer.” Saab ceo Haman Buske used exactly the same words. Not everyone in the EU wanted to join the project. Malta, Ireland, Denmark, Portugal and the United Kingdom all decided to sit out. Some have said they may sign up later, but they are not yet willing to give up so much control over their national defense. The 23 nations are pushing ahead using the Permanent Structured Cooperation (pesco), an EU legal framework outlined in the Lisbon Treaty. pesco allows a smaller group of EU nations to work much more closely together on defense matters, leaving the rest behind. The agreement is not just a significant step toward an EU military; it is also a significant step toward a two-speed Europe. The only times a smaller group of EU nations has left others behind were on relatively trivial matters, such as divorce proceeding, patent law and prosecution of fraudulent use of EU funds. Nations that do not meet their obligations under pesco can be kicked out. This will put significant pressure on EU nations to boost their militaries. The agreement, for example, states that everyone involved has to regularly increase their defense spending until they meet the group’s goal. Yesterday’s signing ceremony was the joint notification from the countries involved that they wished to set up the pesco—the first step in its creation. The 23 nations committed to spending 20 percent of their defense budgets to fill gaps in the EU’s military, when taken as a whole. One fifth of their budget will cater to the needs of the EU rather than that of their own nation. They will also agree on common standards and work together on common projects. For example, instead of each nation spending a lot of money developing and designing its own tank, the bloc could work on just one. They also agreed to make it easier to move military hardware across Europe more quickly. Also high on the priority list is improving the EU’s rapid reaction forces. In theory, the EU has 1,500 strong battle groups that can be deployed in five to 10 days. But they’ve never been used. In March, the EU took significant steps to make these groups more useful. They agreed to create a headquarters for military training missions, which could be scaled up to become a full military headquarters in the future. They are also revamping the way these military missions are funded, so the country sending all the troops doesn’t have to pay all the bills. The pesco aims to “substantially” contribute to these groups. It includes the obligation for these battle groups to carry out military exercises. At the meeting yesterday, the European Council reviewed the progress toward the creation of the European Defense Fund, which would help EU member states coordinate their defense research spending. All this means the agreement could be a major step toward a more powerful European military, not just a more unified one. European leaders have talked about an EU military for decades. But now several factors are coming together to make it happen. The rise of Russia and the spread of Islamic terrorism are making Europeans nervous. Britain is on the way out of the EU, so it can no longer block new defense arrangements as it did before. America has been pushing European nations to spend more on their militaries for years and is very supportive of an EU military. And after the election of President Trump, EU leaders have been vocal in how little they believe they can rely on the U.S.
Few in the U.S. are giving much thought to what is happening here. Europe has huge power potential. America is pressuring Germany to spend 2 percent of its gross domestic product on its military. If Germany follows through, it will have a military budget much larger than Russia’s. Start combining that with other nations, and you have a force to be reckoned with. The European Union has an economy roughly the same size as America’s. France is already a nuclear power. The Netherlands, Germany and Italy host American nuclear bombs. The news from Europe yesterday is another major step toward the advent of a new military superpower. That alone should be concerning. There’s no guarantee that the new superpower will be friendly toward the United States. But there’s another reason to watch this development. Why did he start sounding this warning so many decades ago? Because the Bible prophesies of exactly such a union. The Bible contains powerful warnings that a military superpower in Europe is a huge danger to the peace of the world.